But sawing the letter trays is beyond me. Or at least beyond what I was prepared to do at the time. I made a set of "love", "hope", "peace" and "joy" (the 4 Sundays of advent) for someone who reads this blog, so you can't see them until after Christmas. 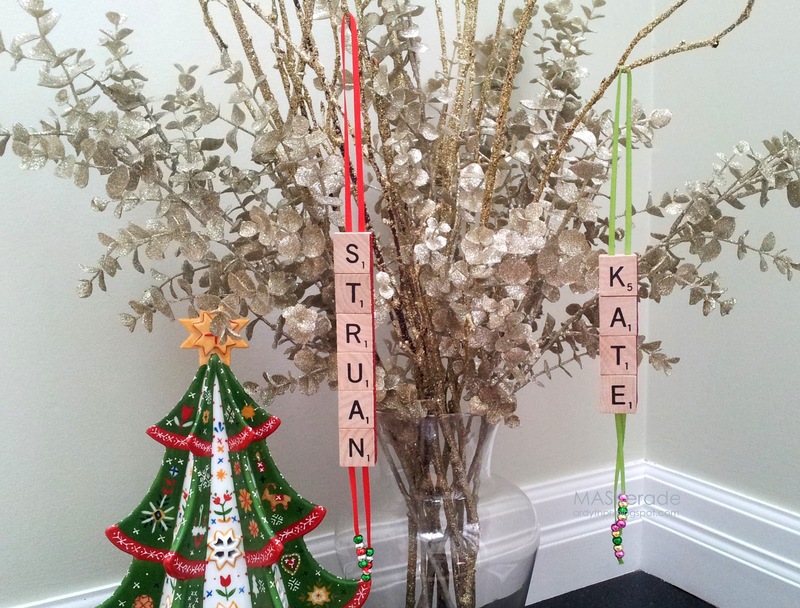 Then I spoke to my sister who had also seen this Pinterest photo and suggested a vertical orientation and since I had the letters left over, I made ornaments for my kids. I glued the letters I needed to a strip of cardstock. Then I glued the ribbon loop to the back of the cardstock before adding another layer of the wooden tiles (blank side facing out). I'm in the midst of putting Stickles down the sides (see below), but it takes a lot of drying time, so I'm afraid you're seeing these in progress and not quite completed! I added some beads at the bottom of the ribbon for extra colour and fun! I'd be handing over the saw to my hubby! I love the set and the ornaments...so adorable! What a cute idea! 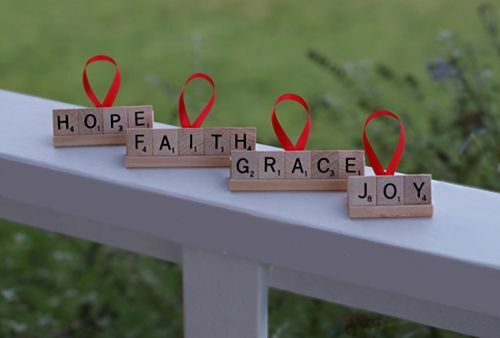 LOVE the "love", "hope", "peace", and "joy" idea too!! So creative!! Ardyth I have had a tin of Scrabble tiles in waiting for at least two years now. You are inspiring me to get cracking and make some ornaments finally! I saw this on pinterest and plan to do this for my grandkids' ornaments next year. 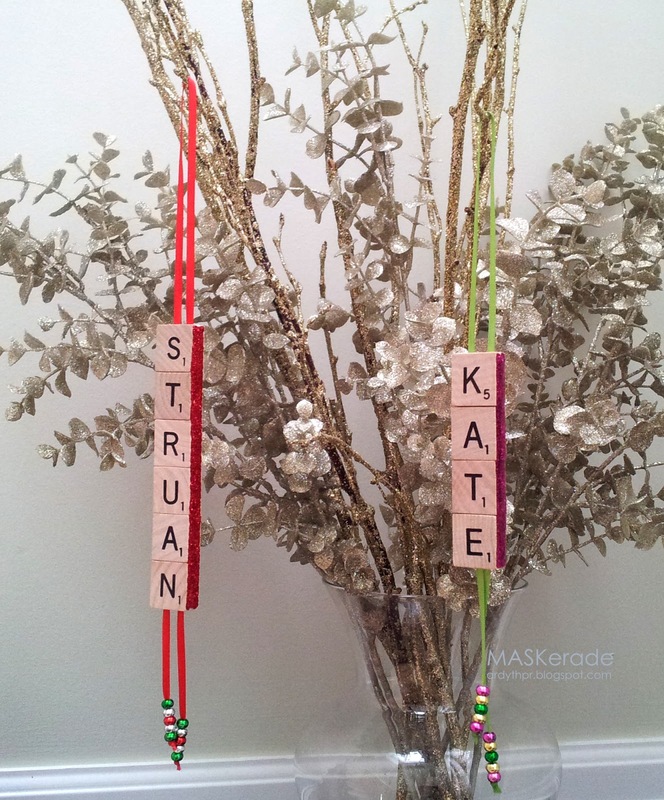 I have had Scrabble pieces for a while, even a travel set with smaller letters that I made into bracelets for some of my girls. I also got a set with white tiles with red or black letters. These are the ones I think I'll use for the ornaments. Darling idea - love it! You never cease to amaze me! These are totally so crafty and beyond cute! 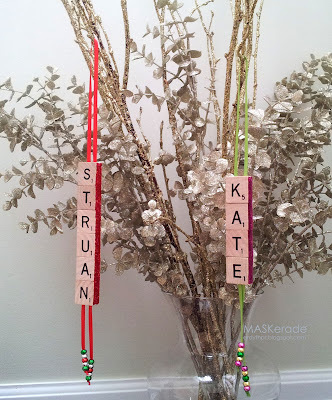 You dressed them up perfectly with the beads - green & red for Struan (such a COOL name) and pink and green for Kate! ...hmmmm, I wonder if anyone would miss a few tiles from the Scrabble game that we keep at our family cabin? Brilliant and beautiful (that's my attempt at a "cas" comment :)! Scrabble tile shopping for sure! Sooo adorable!! Love this craft!!! I bought a Monopoly game at a garage sale this summer for the money. At some point I'll make something with it. The property cards would be fun to use too.